Maintaining a blog is more than just writing blog posts. 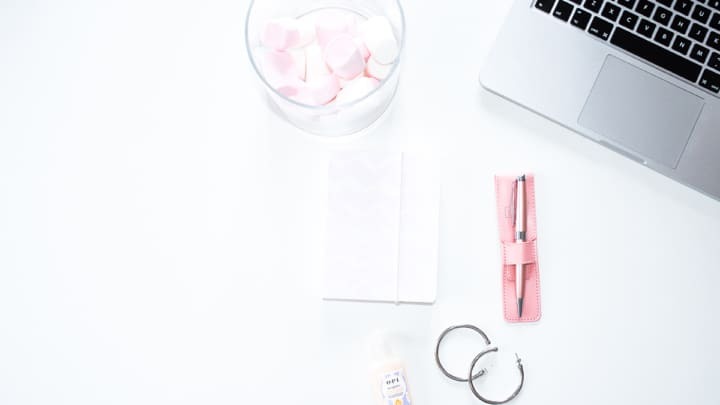 There is so much that goes into having a successful blog like writing content, promoting your blog posts, creating freebies for your audience and figuring ways to monetize your blog! But, one thing to remember is as you are writing new blog posts, you have to pay attention to the old blog posts you have! Tools get outdated, platforms visually change, bloggers update their Gravatar image and sometimes blogs that you link to no longer exist. There may be some blog posts you need to frequently update more than others. I feel that round ups are the type of blog posts that you need to check more than once every three to six months! While round ups are a fantastic way to grow your blog traffic, they need special attention after they are published. But, for most of your older blog content, you want to freshen them up and make them appear like new again. Let’s look at 13 easy ways you can start updating your old blog posts. 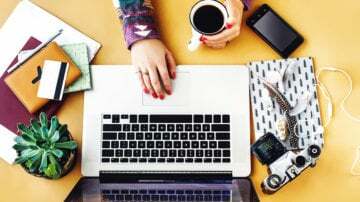 For bloggers, this is the way to market their blog and grow their brand. 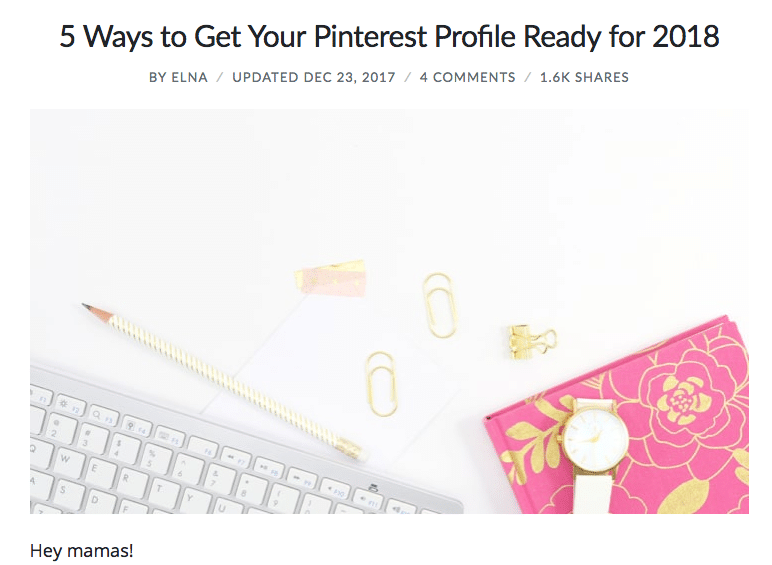 Marketing on Pinterest is also more important for us bloggers than ever before so if you’re not on it, it’s time to start! 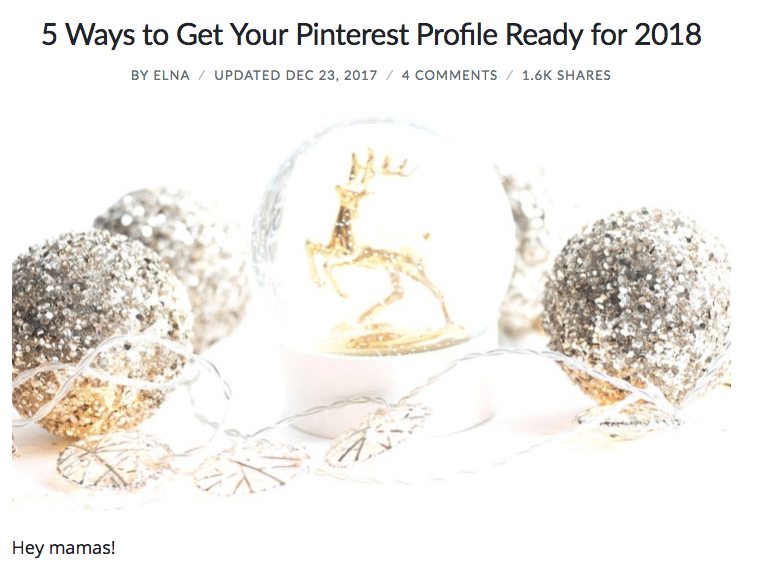 One easy way to grow your Pinterest profile is to add new pins. And you can fresh up old blog posts this way too. You can make a new blog pin using PicMonkey or Canva. You can check out my tutorial using PicMonkey here! On my blog, I show my feature blog image. This is the horizontal image that I base my social media image off of. One of the things I do during Christmas is write evergreen blog posts (mostly) but use Christmas inspired images. But, as the months go by those images aren’t relevant any more and make the blog posts seem old and outdated. So I revive them and give them a new feature image. Even if you don’t use holiday-themed images, you can still update your older blog images if you updated your brand or look. Sometimes you may add the year to a blog post to make it more significant for that time. It usually is around tools or serivices that indicate that your blog post is up-to-date. For example, I have a blog post titled: How to Increase Blog Traffic in 2018. For the new year I can update that to 2019 in the title as well as update the copy to make it relevant for that new year. Remember though – DO not change the permalink; only change the tittle of your blog post. The permalink is part of the blog’s URL and that can ruin your ranking on that blog post if you change it. In standard blog posts, usually the oldest comment is the first comment you see. But, you can change that easily! You can make the most recent blog comment be the first to see. And what this does is turn an old blog post into new content again. It appears that the post is recent based on the comments. You can do this with your WordPress blog by going to Settings > Discussion. From there under other comment settings you can switch older for newer. This “easy” tip comes with caution! You have to go into your WordPress theme and change code to show the last updated date. I have a post that details what you need to do so check out that blog post if you want to show the last updated date. Why show that date vs. the publication date? 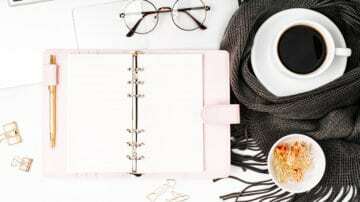 If you are in a blogging slump and don’t write blog posts for a month or two, having the publication date will show readers that gap in your content schedule. For some, this may turn them off and feel that your blog isn’t up-to-date or useful for them at that time. Google wants to show the most relevant post based on the search topic. This also means up-to-date content. Now, for popular blogs the old out-dated blog post may still rank #1, but generally if you have an updated date, it helps people searching for an answer to pick your blog post since it’s most recent. For example, my blog post about activities to keep kids busy is on page one for a relevant term. When looking at the results, it seems that my post is the most recent out of the results, which can sway a user to choose my post over others. When I started Twins Mommy, my main strategy was using Pinterest marketing. This was new to me and I had to learn how to use that platform to market my blog. In the post I wrote talking about this new strategy, I took screenshots of Pinterest at the time. If I wanted to, I could update the images, but I won’t as that post was a case study and I want to look back to how many followers I had and things like that. But, if you write an income-generating blog post on a tool or service, it’s a good idea to update it. This can help grow your income since readers will stay on your post and click your affiliate links if the information presented is up-to-date. There have been a few times I had to change the images in my start a blog post as the company changed colors or fonts or rebranded slightly. While this is time consuming, I feel it’s necessary to help with conversions. Remember those round up posts I mentioned in the beginning of this blog post? This is where I find a lot of broken links. While there is a WordPress plugin to help you find those broken links, I don’t mind visiting old blog posts and checking them out every few months. For example, over one holiday season I did 12 posts of freebies. Many of those posts have broken links as those freebies are no longer offered so I have to spend time finding alternate freebies or pare down the list. I typically check my popular posts from Pinterest, round up posts and income-generating posts for broken links. On round up posts, you may have to update head shots if you feature bloggers or images in the blog post as well. Sometimes the Gravatar image I use for round ups no longer has a Gravatar image. This tells me that the blogger no longer has that email address. So I either contact them on social media to get their new Gravatar address or use an image of them from their blog. A great and easy way to update old blog posts is to add a YouTube video. This enhances the post, makes it more valuable to the reader and helps create a better blog post! I love adding YouTube videos to my content since I tend to write long form posts, I know not everyone has time to read my posts. So, having a video – or even a podcast – in your blog post makes it super easy for a reader to stay on your blog longer and invest in you sooner. As your blog grows with more and more content, you will have created new freebies to grow your email list. If you find an older blog post that can promote your freebie as it’s relatable content, you can add it or swap whatever freebie you are promoting in that post. This is great to do as the original freebie may just not have worked for that blog post. I also have a Pin graphic guide that I promote on certain blog posts, but I’m swapping that for my Pin Promote planner instead. So find out what’s relevant and working and add it to older posts. When I created the start.grow.earn blogging course freebie I placed it in a lot of my older blog posts that were relevant to help grow my subscribers. Make sure to make time to add that new freebie to all relevant blog posts! Of course, a great way to spruce up old content is to update the content! Did you learn something new you can add to a blog topic? Did you create a course that would be great to promote in an older blog post? Did you learn a new tool you could talk about in a blog post? You don’t have to add new content to older posts all the time, but I would if the post is popular. Don’t forget to optimize older blog posts for SEO. Personally, I don’t do this, but should! I know for my blog Smart Mom Ideas, I can go to older blog posts and add some keywords or look at Pinterest SEO to see what phrases I can add. To do this, you need an SEO strategy. You can find my SEO strategy here, but make sure you know your audience and their problems and from there understand the right keywords to use for your blog content. 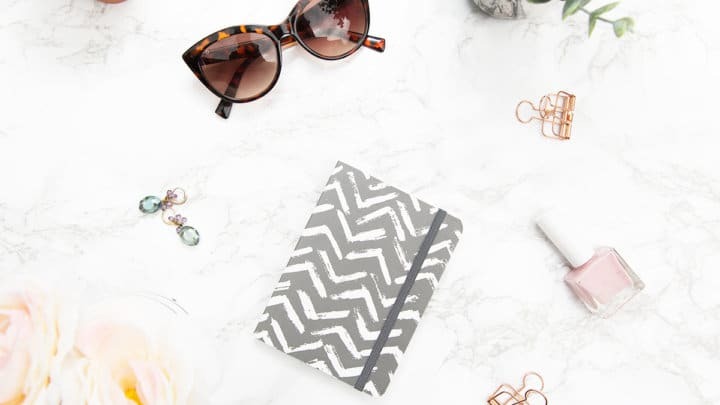 It’s like spring cleaning for your blog, right? 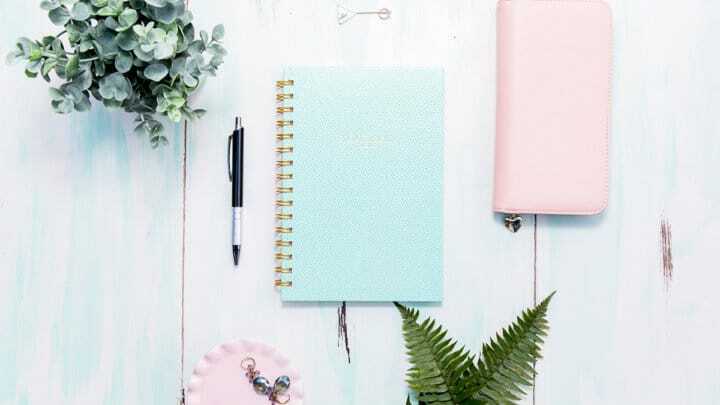 While consistently writing blog posts is a great strategy to grow your blog traffic, making sure your older blog posts are up-to-date is just as important to grow your audience and have them invest in you. Now, it’s your turn – what do you do to update old blog posts? Share with me your tip in the comments! This is full of useful information. Thank you for sharing! You’re welcome! Glad you found some tips to update old blog posts! Thanks for the great tips! I have done some on my blog: changing the title, put a video, put new images. But, I wonder how can I create a freesbie? Do you have any idea about what kind of freesbie? My blog is about lifestyle and parenting anyway. That’s awesome you are updating your old blog posts and freshening them up! For help on creating a freebie to grow your email list, check out this post, it has ideas and a video tutorial. Thanks for all the great tips! My blog is only 5 months old, but I feel like I’ve learned a lot since I started it and my older posts could use some sprucing up. I’ll definitely be implementing these tips! Love your blog too! Thanks for stopping by on my OHTER blog 🙂 Yes, updating your older content is a chore, but must be done! You’re welcome! Glad you found some tips to fresh up your blog! Great article. Excellent explanation about how to freshen up old blog posts. I will definitely going to try all these tips on my old blog posts. I have bookmarked it for future references. Thanks for sharing this article. Thanks so much. Glad you found some great tips to freshen up stale blog posts! I don’t give enough time for doing this but I know it’s important for sure! Elna, I just have to say it, you are so smart. I love all of these tips. I am going to start implementing these. I love making images, especially so I will replace some of my featured images, and make new pins. Wow, I had no idea that there is so much upkeep with old posts. blogging sure does require a lot of work and planning. But when you love something its all good. thank you for these tips. Thanks so much for stopping by! Yes, keeping up to date with your blog posts can be a bit overwhelming, especially if you start late! But you can always outsource that type of service or just spend a day up-keeping your blog!